JACKSON, MS, August 19. 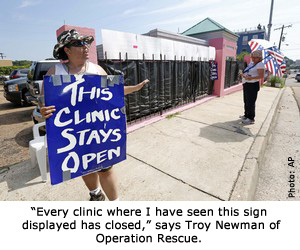 2013 (Operation Rescue) - A court challenge to a Mississippi law that could close the last remaining abortion clinic in that state has been set for trial beginning on March 3, 2014. At issue is a provision of the law that requires abortionists to maintain local hospital privileges. The Jackson Women’s Health Organization, owned by Diane Derzis, cannot comply with the new law and sued to block its enforcement in 2012. Derzis employs out-of-state abortionists who fly into Jackson, Mississippi, to do abortions then fly out, leaving women suffering complications without continuity of care. That issue was dramatically illustrated earlier this month when an abortion patient suffering a medical emergency was transported from JWHO to a local hospital by ambulance. The abortionist of record, Bruce Elliot Norman, has no hospital privileges in Mississippi. Neither does any other abortionist employed by Derzis. Jackson area hospitals have refused to extend privileges to these out-of-state abortionists due to liability issues. “Derzis’ emergency plan is to ship injured women off to the hospital and let the emergency room physicians figure it out. This can delay emergency treatment and further endanger the lives of women.” said Troy Newman, president of Operation Rescue, who first recommended the hospital privilege requirement to lobbyists in Mississippi. Two noted physicians who submitted declarations to the state legislature in support of the Mississippi law agree. A declaration submitted by John Thorp Jr., M.D. notes that hospital privileges make it more likely that abortionists can effectively care for patients. He stated that 73 percent of hospitals report inadequate on call coverage by specialists, especially OB/GYNs. Dr. Thorp also concluded that hospital privileges prevents patient abandonment by itinerate physicians. Dr. Thorpe backed up his statements with impressive qualifications, including a 57-page curriculum vitae. I have worked in local emergency rooms across Virginia for over 30 years. When women have come to the emergency room with complications related to an abortion, never once have I received a phone call initiated by the provider conveying information about the abortion, the young woman’s condition, or potential complications. I have always had to evaluate the situation, come to my own conclusions, and initiate what I thought was appropriate treatment. This definitely created some time delays that were not in the patient’s best interest. I have called many abortion clinic physicians but never once has the provider come to the emergency room to assume care. I have always had to call a staff physician. This then creates another delay since the staff physician is taking care of his/her own patients, but now much change his/her schedule to assume the care of someone else’s patient. These delays can have life-threatening implications when dealing with hemorrhage or infection. Derzis’ abortion businesses have a history of botched abortions resulting in emergency hospitalization and health and safety code violations. One of her abortion clinics in Birmingham, Alabama, where Bruce Norman also works, was ordered to close by court order on August 8 after pro-life organizations, including Operation Rescue and CEC For Life, documented that it was operating illegally without proper licensure. That same Derzis clinic has been previously closed by the State after pro-life groups documented two abortion emergencies in one day and filed complaints, which led to the discovery of a third patient who was hospitalized at the same time as well as 76 pages of serious health and safety deficiencies. The Jackson Women’s Health Organization was ordered in 2011 to remedy plenty deficiencies of its own, including a building in ill-repair, failure to maintain fire extinguisher,s and provide emergency lighting, having doorways so narrow that they cannot accommodate a gurney, and shoddy record-keeping. Abortion supporters have rallied around the JWHO, defiantly displaying signs showing their support.